Find a LED Entertainment for hire near you in minutes! Option 1. Enter your event location below & contact a LED Entertainment directly! Option 2. Request multiple quotes from available LED Entertainment Get Quotes! Option 3. Read information & advice on hiring LED Entertainment Read Advice! WANT TO KNOW MORE ABOUT LED EntertainerS? Read on for the most comprehensive guide to booking an LED Entertainer, including how much an LED Entertainer costs, exactly what they will do at your event, plus tips, advice and information to help make your event one to remember! What exactly will an LED Entertainer do at your event? 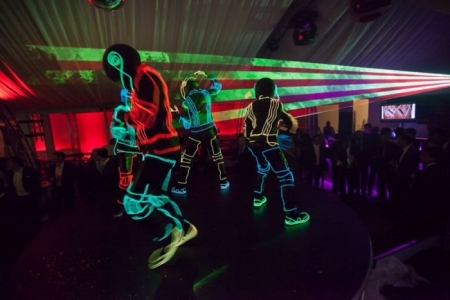 LED Entertainment is a cutting edge performance that can mix anything from choreographed dance, instrumentation, Hi-Tec LED suits, hula-hooping, juggling and much more to culminate a unique and fun experience for you and your guests! Hire an LED Entertainer for your event, and you’ll get a professional party-starter who will create a brilliant party atmosphere and just as equally create a chilled out, artistic vibe. Hire talented musicians to perform with LED instruments and you’ll get dazzling focus who will work with the crowd via audience interaction. The hired LED Drummer, LED Saxophonist, LED Guitarist, LED laden Singer will electrify family, friends, clients and co-workers will a show that will light up any event! Mainly, an LED Entertainer will delight you and your guests with a fantastic service which will put the wow factor into celebrations and impress everyone! What event types are LED Entertainers hired for? Hire an LED Entertainer for your wedding evening drinks reception and you’ll get a totally unique show which will elevate your wedding evening entertainment into a night of colourful fun! If you want to bring a club vibe to your wedding, then an LED Entertainer will do just that! The LED Entertainer can be set up on the stage to perform along with agreed music, or they can be a mix and mingle wedding entertainer, mingling with your family and friends! As there is such as varied amount of LED Entertainers to choose from, the show can be designed just for your wedding entertainment tastes! You may want to hire an LED Drummer show to perform along to the music and give your wedding guests a dazzling focus?! The LED Drummer can have a full LED drum kit, or they can simply have just a snare drum tied around them! You can expect a sparkling visual which will include electrifying blues, glistening purples, intense reds and glittering greens! Every aspect of the drum kit will be illuminated, even the drumsticks and maybe even the Drummer themselves! They’ll bang along to your favourite tunes, all the while getting the party going and raising the energy as a whole! There’s not just LED Drummers to choose from however, LED musicians can come in many forms and can include LED Saxophone players who will blow the best jazzy melodies of all time, whilst decked in brilliant LED technology! Perfect for satisfying your sound and vision! If you want to turn your wedding evening reception into a fantastic dance show, then hire professional LED Dancers to boogie along to whatever music you may have lined up! Again, this type of performance can be a varied affair. You may just want to simply hire a solo LED Dancer to light up the stage and give the wedding guests a focus, or, you may want to hire a group of LED Dancers to put together a choreographed performance! The LED Dance Group can perform a synchronised show which will take your wedding evening reception to another level and will certainly be a talking point amongst wedding guests! You may be wondering what LED Dancers wear? Well, again, this can vary but you can be sure that the clothes can be a mixture of LED jumpers, LED hats, LED shoes, LED dresses and LED trousers and shorts! Search our site for an LED Entertainer local to you for your corporate event and you will get a professional show which will certainly entertain! An LED Entertainment company can provide you with a dazzling show to light up your work party! Whether it’s a work Summer party, a colleague’s leaving party, an end of financial year party or a work Christmas party, the hired LED entertainment will make for a wonderful focus for your clients and workforce, and will also work as a captivating ice-breaker! The LED Performer can come in many different forms such as an LED hula-hoop act! The LED hula-hoop act will grip your crowd with a charming and mesmerising performance which will see the performer spin an array of LED hula hoops, along to the music of your choice! An LED Act will go down a storm as festival entertainment (in a tent or at night only!) or as indoor holiday resort entertainment. The hired LED performers will put on a spellbinding show which will look futuristic and completely new to a lot of people! If you are searching for acts to perform at your club night, then we would highly recommend hiring an LED Act to delight your clubbers! The hired LED Entertainers can be put on podiums as solo artists, on a stage as part of a choreographed dance act, or as mix and mingle LED acts who will perform on the dance-floor! An LED Act can come with not only state of the art LED technologies, but many LED shows will also incorporate graphics, lasers and projected images to give a totally full-on, unique experience! This is why LED entertainment would be ideal for parties! Whether it’s a birthday party, a Halloween party, a Christmas party or a leaving party! As mentioned, LED entertainment can come in many forms, from LED juggling to LED musicians to LED synchronised Dancers! Search our site now to hire an LED performer and everybody will certainly remember your party this year! How much do LED Entertainers cost to hire? Our simple to use entertainment directory allows you to firstly search for the best LED Entertainers who are local (or travel to your area) and then via the contact form you may contact them directly to enquire for a no obligation quote to perform at your event. Some acts will also add a rough price guide to their profile for your convenience. What are the usual set formats and performance lengths for LED Entertainers? An LED Entertainer can be very versatile when it comes to timescales at your event/function, wedding or party. The average time of an LED Entertainer’s show will be about 45 minutes to 60 minutes. Each LED Entertainer's performance times will change however. The easiest way to enquire about this is by using our simple-to-use messaging service here on the Entertainersworldwide.com website. How much space will an LED Entertainer need at your event? There are so many different types of LED Entertainers out there that this will really depend on which performer you book. If you hire a solo LED Entertainer, then they will need a stage area of at least 8’ X 4’. Hiring 5 or more performers will mean that you’ll need a stage of 20’ X 16’. Again, this does depend on what type of performance you are hiring, for instance, an LED Drummer with a full drum kit will take up much more room than an LED Saxophonist. We therefore advise to message the LED Entertainer to find out more. What equipment and set up requirements do LED Entertainers need? Most LED Entertainers will be self-sufficient and won’t need any set up requirements. If the venue is large, they may require a PA, and a microphone to perform at their best. What they will need will be basic info regarding the venue to help enhance their performance as much as possible. This can be anything from the stage size to the power supply. The main requirement of most LED performance artists is darkness! This is something that will be discussed between yourselves and the LED Entertainment Company ahead of the performance. It is standard practice for an LED Entertainer to require a room where they can get changed and prepare their performance in private. Please check ahead with your venue to see if they a) have a backstage area, or b) a spare room in which the LED Entertainer can set-up. 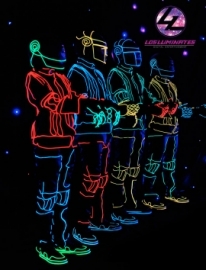 How can you find and book an LED Entertainer with Entertainersworldwide.com? WANT TO RECEIVE A RANGE OF QUOTES FROM LED Entertainment?